Follow me on social media so you don't miss an update! Submit your tinfoil theories here! Professor Charles Xavier, otherwise known as Professor X, is the brilliant leader of the X-Men: a genius telepath who is often seen in his iconic wheelchair. But other times he can be seen walking about having been 'cured', only to them return to the chair. Once might be fair enough, but this constant roundabout of miracle cures followed by mysterious accidents is very suspicious. It is more likely that Professor X could walk all along but was just very, very lazy. In the movies, Professor X is apparently crippled in 'First Class' but then miraculously able to walk again by the time of 'Days of Future Past' thanks to a nondescript serum that Beast had invented. He is once more in a wheelchair by the time of the 'X-Men' film, but after he dies and is resurrected in the body of his comatose twin brother. The next time we see him at the end of 'The Wolverine', Professor X is once more back in his wheelchair, despite any evidence that his brother needed one. The comics are even more suspect. Professor X claimed that he originally lost use of his legs when he met an alien called Lucifer in the Himalayas who dropped a stone block on him. 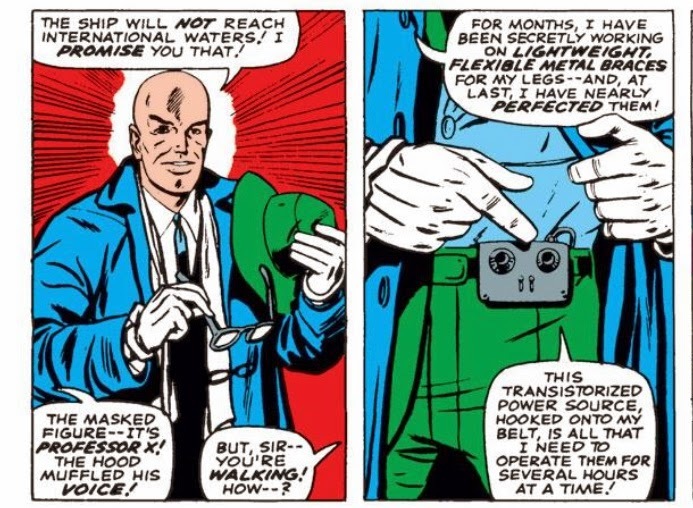 Over the next forty years, Xavier's ability to walk see-sawed back and forth, with miracle curse after miracle cure including (but not limited to) magic space crystals, nanobots, mind transfer into a clone body and actual magic. Surprising, Xavier seems unwilling to share these miracle cures with the rest of the world, not wanting to subject any of them to scientific analysis to help others in similar predicaments. And each of these 'cures' inevitably fails, inexplicably leaving Xavier back in his beloved wheelchair again. What is more likely: that Xavier somehow repeatedly stumbles across one-off miracle cures to his paraplegia, only to constantly lose his powers of walking again, or that he is just lying. Either Xavier is both the luckiest and unluckiest man alive, or he is simply incredibly lazy, preferring to sit in his chair all day than walk about. As a powerful psychic, Professor X is used to an easy life. He can easily move items with the power of his mind, and it is easy to imagine he rues having to exert the minimal effort that it takes to use his legs to walk. Claiming he was crippled via a clearly fake story about meeting aliens in the Himalayas enabled him to trick his friends into pushing him about in a chair and be comfortably seated at all times. It is possible that at periodic intervals he gets bored of this lifestyle, or else is caught wandering about his mansion at night when he thinks no-one is looking. It is then that he invents a story about being cured via magic crystals or tiny robots or clone rays. Medical resources are limited. Far from being a hero, Professor X takes away time and effort that should be spent on the genuinely disabled. He is either a liar or else he is a man so selfish he doesn't want to share his magic space crystal cures with the world. I don't know which is worse.